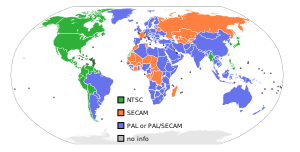 Television encoding systems by nation; countries using the NTSC system are shown in green. NTSC, also known as National Television System Committee, is the analog television system in North America, South America, Burma, South Korea, Taiwan, Japan, Philippines, and some Pacific island nations and territories. A standard defining the NTSC system was published by the International Telecommunication Union in 1998 under the title "Recommendation ITU-R BT.470-7, Conventional Analog Television Systems". It is not publicly available on the Internet, but it can be purchased from the ITU. Ed Reitan (1997). CBS Field Sequential Color System. This page was last changed on 7 February 2016, at 23:32.